Each of these maps provides additional context for the total solar eclipse of August 21, 2017. 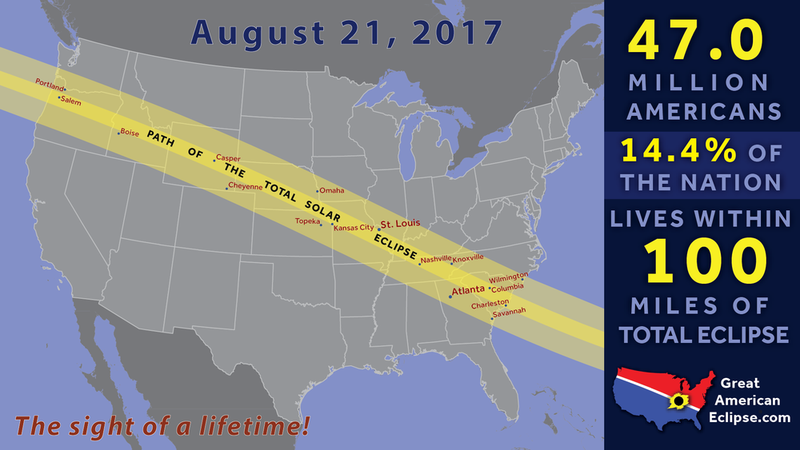 You may freely share these maps on social media, websites, blogs, and other media provided that they are not modified and a live link to www.GreatAmericanEclipse.com is given. Click on any of these maps to see an enlarged version. This map with stereographic projection shows two interesting facts: The entirety of North America will experience a partial solar eclipse as well as four other continents: south American, Asia, Europe, and Africa. These are all of the total solar eclipses to cross the present territory of the contiguous 48 United States. How long will it take to drive to the centerline of eclipse from my home? This is the result of a compute-intensive process to determine that. This map is inspired by some old eclipse maps published by the U.S. Naval Observatory. Those maps allow you to fairly accurately determine the times of begin and end of the partial phase of eclipse. This infographic is from our book, See the Great American Eclipse.